Inkblots have been around as long as there has been ink. It is also fun to create inkblots by folding them together. Start with the basics, as you scroll down, you will find more complex things to make and do with inkblots. If you what to be really adventurous, try out some Rhodia smooth surface paper. Fold a piece of paper in half. Apply a dot or two of water, and a dot or two of ink. Fold the paper, and apply pressure with the palm of your hand. Unfold. Inkblots can help anyone neatly sidestep their logical brain to access their creative right brain right away. What one sees in an inkblot can be the impetus for a short story for creative writers, aid in character development for the budding playwright, provide a visual workout for a visual artist, or even the beginnings of a more developed painting. As soon as you make an inkblot, you will start seeing things in them–fantastic creatures, monsters, landscapes, flowers and plants. If you don’t see anything at first, give yourself time! Simply draw around what you see and color it in! 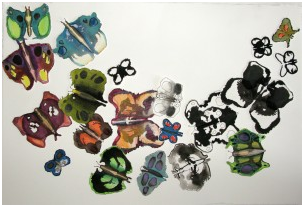 You can make inkblot butterflies, color into them with colored pencils, and collage them on a page or in a diorama. Prefold you paper, as instructed above, and apply ink on one half in a simple butterfly shape–one wing, perhaps with two lobes, a dot on each wing lobe, a quick line of ink for the body. Fold and unfold–a butterfly! Some will be more butterfly-like than others. Questions: When was the Rorschach test first used? Answer: The first publication of Hermann Rorschach's 10 inkblots was in 1921 as a monograph, Psychodiagnostik. For the 1940s and 1950s, the Rorschach was the test of choice in clinical psychology. In recent weeks we have all learned some trivia about pens. What about the words they write? Did you know the most commonly used letter in the alphabet is “E”? Did you know the least used letter in the alphabet is “Q”? Did you know the first letters of the months July through to November spell JASON? Did you know the dot on top of the letter “I” is called a tittle? Did you know 1 out of every 8 letters written is an “E”? Did you know the word 'almost' is the longest in the English language with all the letters in alphabetical order? Did you know the most commonly used word in English conversation is “I”? In order to keep the art of writing, and writing in cursive penmanship, alive sometimes we all need a little inspiration. It is important to inspire our young ones to keep both arts alive. Here are some fun, sure-fire questions to prompt and get the young creative juices flowing. 1. If I was a super hero what kind of super hero would I be and what powers would I have (This can also be done using villains)? 2. If you were given 3 wishes what would they be and why? 3. If I could invent a new toy what kind of toy would I create and why? 4. If you could be invisible what would you do and why? 5. What would do if you won a million dollars? 6. Write about something you are really good at. 7. Write about 1 thing you want to learn about. 8. Write about a time when you worked really hard to get something. 9. What is the best thing someone has ever given to you? Portable pens that could carry its’ own ink supply were not perfected until fairly late in the 19th century. None of the great writers before that time, from Aristophanes to Shakespeare to Dickens, were in a position to enjoy such an instrument. Even Thomas Jefferson, who later in life sampled an early reservoir pen, had to fall back on the quill to draft the U.S. Declaration of Independence. For the first three millennia or so since the invention of paper, the writing instrument of choice in Western culture was the quill. One simply used a goose tail feather, the process being harvest the feather, allowing it to dry (often by immersing it in a bed of hot dry sand), "gutting" it and trimming off the excess fuzz. The tradition of needing a pen stand for your writing instrument was out of necessity to avoid ink from getting all over your desk. This historical tradition is celebrated today with functional and well crafted Jac Zagoory pen holders. Jac Zagoory Design is nothing if not the epitome of creativity and innovation. Their collections include an almost unimaginable variety of pieces that are just as charming as they are unusual. Just as their mission statement proclaims, Jac Zagoory Design aims to create, innovate and acquire pieces that will help others reach for inspiration in their own lives. To help put a smile on the faces of those that value their rewards like they value their work. Although a relatively young company, Jac Zagoory Design has gained a solid footing in the world of art, pens and luxury merchandise. Their products have been featured in Wired Magazine, Stylus, Gift and Decorations, Greetings, Pen World, the New York Times and in many foreign publications. 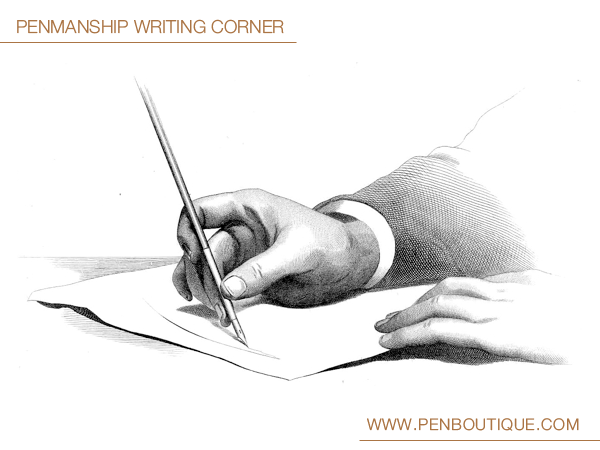 Share your moment and Win the Pen Boutique Contest ! c. Bring maximum votes on your wish with "Likes"
d.Share the Current Post and Get 2 extra votes. 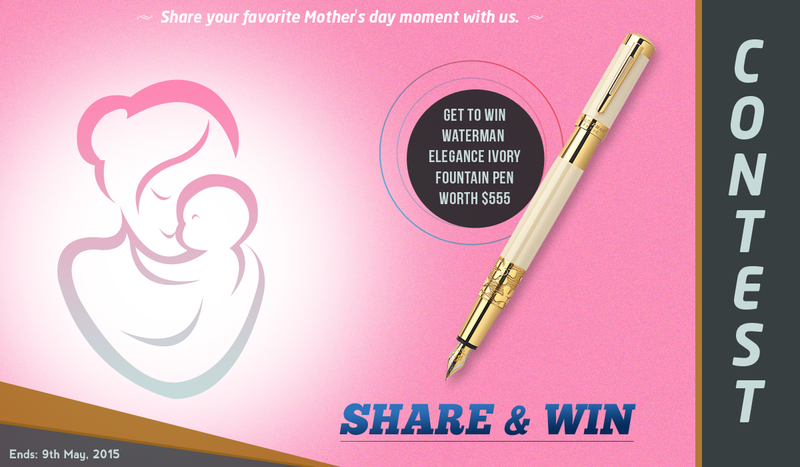 We are hosting this "Share Your Moment" for our Pen Boutique fans. 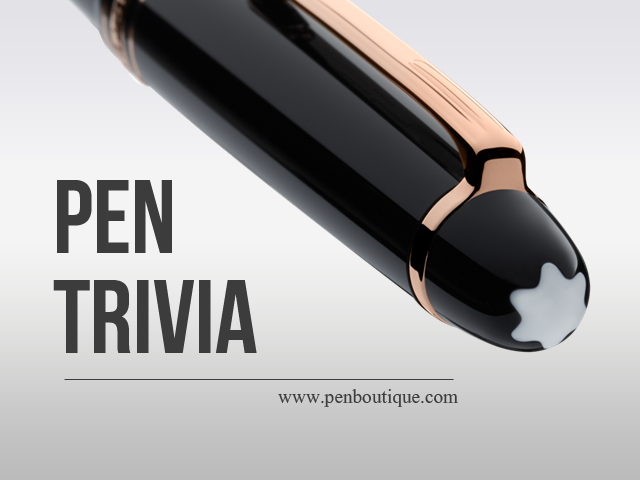 The winner of this contest will be announced on our Timeline and Pen Boutique blog ( blog.penboutique.com) on Mother's Day (10th May 2015). 1.) This giveaway/contest is void where prohibited by law. The contestants assume the total responsibility of knowing their local laws in regard to "Share Your Moment" Contest ! and are subject to any local, state, national or international laws. Friendship Circle accepts no responsibility for making these individual legal determinations. Back in the days when everyone used quill pens and fountain pens the one thing that could be found on every office or writing desk was an ink blotter. Ink blotters were usually made of a soft absorbent paper formed into a card and were used to dry up excess ink. Today, these vintage blotters, made in the 1930s and 1940s, are very highly prized and sought after collectibles. Ink Blotters were a very popular form of advertising that were often given away by fountain pen manufacturers, banks, merchants and especially Insurance Companies. Antique Ink blotters were as common as business cards are today. 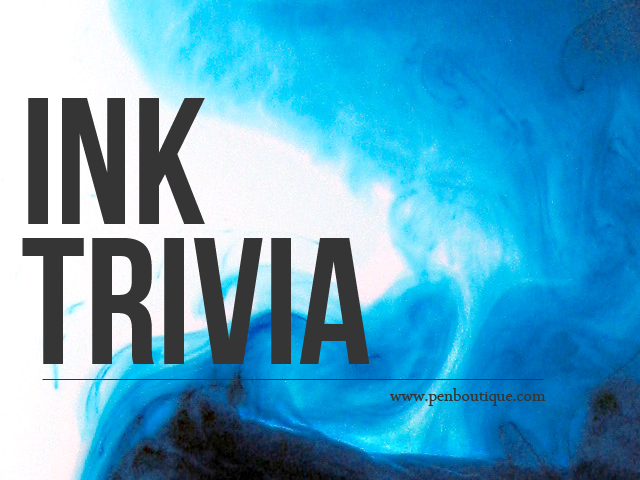 Written references to ink blotting paper in America have been found beginning in the late 1700s. In the late 1800s, a patent was issued for improved blotting paper which featured a smooth surface on one side and a blotting surface on the other. 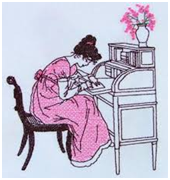 Rocker blotters were an important piece of desk equipment from the late 1880s until the 1950s. This type of blotter had a handle 2 to 5 inches long and a rounded surface 2 to 3 inches wide where the blotting paper was attached. Blotting paper is used to absorb ink or oil from writing materials. Pen Boutique offer two very absorbent brands of blotting paper. When was blotter paper first found in the United States? A Pen Pal relationship is often used to improve literacy, to learn more about other countries and life-styles, and to make friendships. 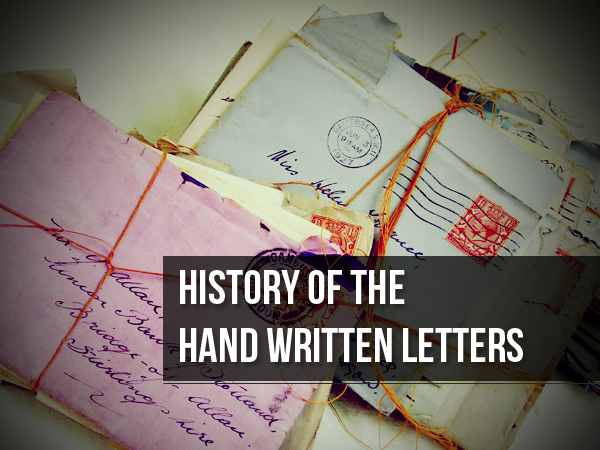 As with any friendships in life, some people remain Pen Pals for only a short time, while others continue to exchange letters and presents for life. Some Pen Pen Pals eventually arrange to meet face to face; sometimes leading to serious relationships, or even marriage. Pals come in all ages, nationalities and cultures. Pals may seek new pen friends based on their own age group, a specific occupation, hobby, or select someone totally different from them to gain knowledge about the world around them. One day in 1961 Groucho Marx received in the mail a note from none other than T.S. Eliot himself. Expressing his admiration for the comedian, Eliot asked him for an autographed portrait. A shocked Groucho sent back a studio photograph of himself, only to receive a second note from the icon of modern poetry requesting instead a picture of the iconic Groucho, sporting a moustache and holding a cigar. A second photograph was sent out and a happy Eliot wrote to thank Groucho: “This is to let you know that your portrait has arrived and has given me great joy and will soon appear in its frame on my wall with other famous friends. 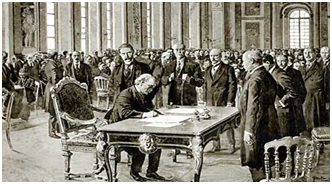 How the Treaty of Versailles, which ended World War II, inspired a new pen company. Aurora is an Italian manufacturer of fine writing instruments, fountain pens, paper and leather goods. Their products represent the first true Italian fountain pens and are still manufactured in their original factory in Turin, northern Italy. It was 1919, the year the treaty of Versailles was signed. In an Italy marked by a post-war crisis, but bubbling with great hopes for recovery, the first steps down a long road were taken with the birth of Aurora, and the creation of the first true Italian fountain pen. A rich textile merchant, founder of the Torino Company of the same name, saw the crystallization of a dream he had long meditated and planned. In that year, the success enjoyed by the Aurora pen coincided with a new historic direction. Italy woke up to the first rays of a sun that was destined not to set, while Aurora became the name of a company destined for success. From those very first years the company showed that it was able to produce writing instruments with inimitable allure and refinement. A unique style which, following the evolution of taste, yesterday as today, brought together experience, technique, precious materials and artisan skill and refinement. Having earned the appreciation of admirers round the world, the trademark represented forms and materials which, from the beginning, were tangible examples of the most refined made in Italy products. The brand is synonymous with high quality, exquisite taste, and fine Italian craftsmanship. Each Aurora Pen is influenced by the renowned culture, artistic legacy, and design characteristic of the Italian tradition. One of the only manufacturers to craft their own nibs, Aurora fountain pens feature fixed points - a reference for future generations of writing masters. 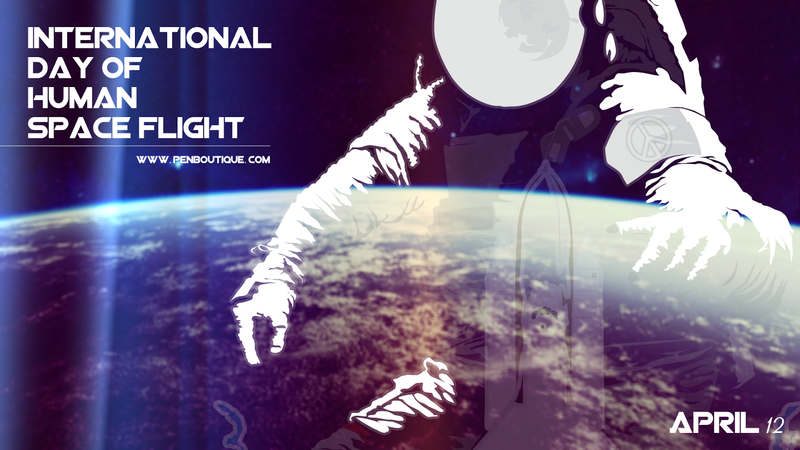 Pen Boutique is currently offering 20% off recently reduced prices on Aurora Ipsilon Resin pens. This is the lowest price available from an authorized dealer! Certain images instantly conjure up this bold color: fire engines, flames, roses, rouges, rubies, rust, tomatoes, blood and valentines. Red pens have traditionally been used by teachers when grading papers – ostensibly to make their comments and markings stand out from the original work. Red is hot. It's a strong color that conjures up a range of seemingly conflicting emotions from passionate love to violence and warfare. Red is Cupid and the Devil. What is the complementary color of red on the color wheel? Answer: Red’s direct opposite is green. If you really want to improve your penmanship you need to practice, An occasional note, birthday card , and a grocery list is a chance to practice, as is the ‘honey do’ list. 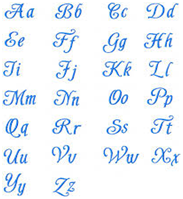 But if you are serious about being able to showcase your exemplary penmanship skills keep a journal, pen a short story or copy cursive writing from a template, anything that will give you more experience forming letters and words. 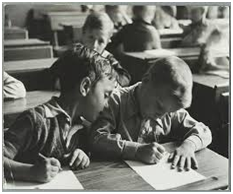 I must admit my cursive is excellent; it must have been all those black and white composition books where I had to practice over and over again each letter of the alphabet. Like anything worthwhile, it takes time. But don’t despair, it will most likely take less than the twelve years I practiced in school! Henry David Thoreau (1817–1862) was an American philosopher, poet, and environmental scientist whose major work, Walden, draws upon each of these identities in meditating on the concrete problems of living in the world as a human being. He sought to revive a conception of philosophy as a way of life. He discussed his own scientific findings with leading naturalists of the day. The Walden Woods Project preserves the land, literature and legacy of Henry David Thoreau to foster an ethic of environmental stewardship and social responsibility. The Project achieves this mission through the integration of conservation, education and research. 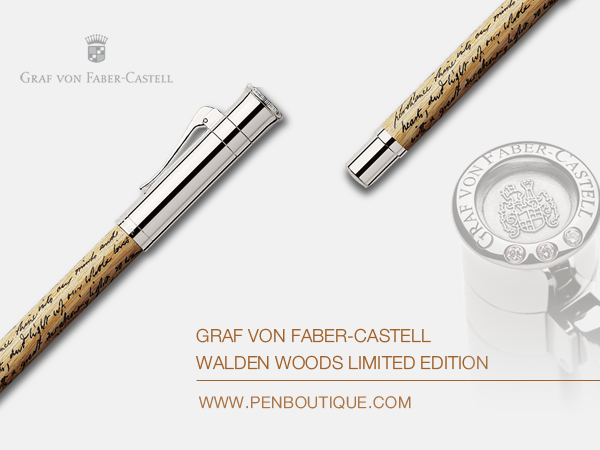 Faber Castell Walden Wood Limited Edition Rollerball Pen: Made from historic, naturally fallen ash wood from the infamous Walden Woods, Faber-Castell is pleased to present the Limited Edition Walden Woods Rollerball Pen - A harmonious combination of selected materials, aesthetic looks, and high degree of functionalism. Platinized metal parts provide the finishing touches to this Limited Edition. Each pen is individually numbered. The pen features a quotation of Henry David Thoreau in his original handwriting on the barrel. Faber-Castell supports the efforts of the Walden Woods Project and American Forests Historic Trees. With purchase, a new tree will be planted and a voucher received for a one year subscription to American Forests Magazine. In appreciation of Thoreau’s contributions to the environment and in honor of Earth Day, celebrated April 22, Pen Boutique is offering a 20% discount on these special limited editions. — Henry David Thoreau, Walden, "Where I Lived, and What I Lived For"